Finally have a model modelled and painted up to show off. I've searched around with google, and honestly I don't think I've found anyone who has done a project quite like this. Really wishing I could find a charger. 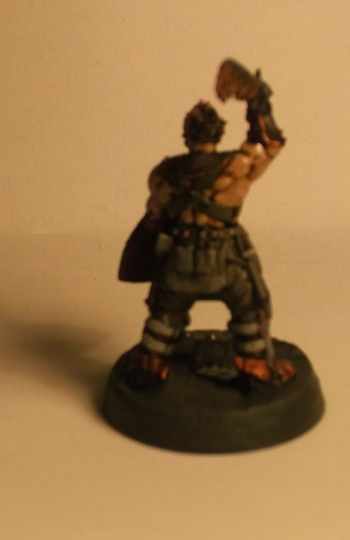 My Smaller camera doesn't seem to pick up the details all that well. I present to you the first Necrostartes. The amalgamation of Space Marine Physiology and Necron Technology. The Tomb Lords were a normal Codex chapter, until a Techmarine started researching the Necron Technology that scatter the chapters home System. The Necro Armour offers the same level of protection as standard Power Armour, but has a small profile, making the marine a bit harder to hit. The Armour also possess reconstructive properties that augment the Marine's normal pain and injury resistance. Other Necron Tech is still being researched, though subordinate Machanicus are quickly making headway in operating the "Synaptic Disintegrator." The paintscheme looks a lot better in person. I think I really need to invest in a light box, and find a suitable place for it. Transistioning Necron Weaponry to represent Marine weaponry has been the hardest part of this, though the weapons I can represent are certainly some of the more lethal variety. 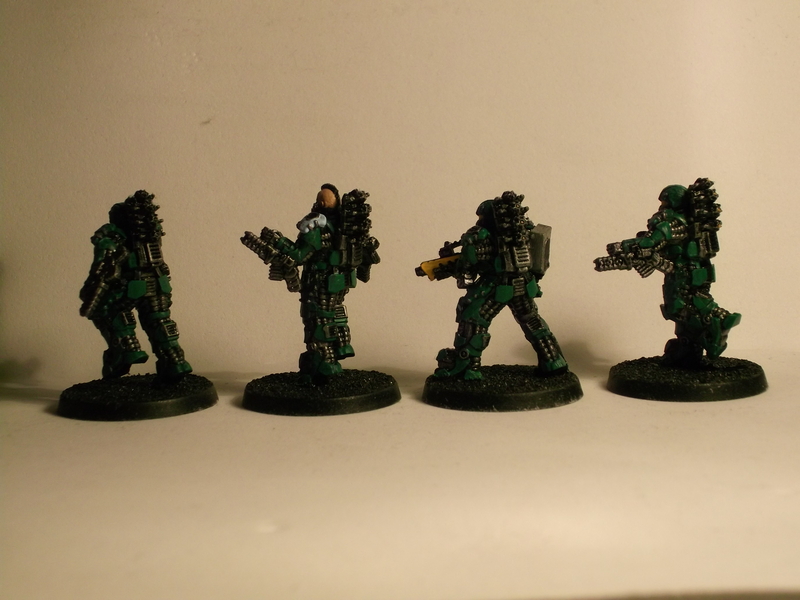 Scouts will also be interesting, though I am thinking of just using normal scouts with a little bit of necron tech for weaponry. Looking forward to moving on with this project, though I do still have a large amount of models to paintup and finish before I can continue adding to the collection. Compared to my Space Wolves, the Necrostartes uses a lot more different parts more more scources, so is harder to grow steadily. Time to update my Junkers. Had a couple sprues sitting around, and with some extra bits floating around I got inspired to produce a Preator to lead my Junkers. Suikar is like all other Preators, but his personal preference is to not wear the garish parade uniforms his peers wear to the battlefield. What identifies him is the eagle on his back, and the sword in his hands. The Senate of Ironglass often has issue with some of Suikar's decisions, but his prowess on the battlefield and his charismatic persona save him from their worst punishments. Oftentimes the Senate will simply send his Legion to further and more dangerous battlefields, hoping that Suikar and his supporters will meet a gruesome end. 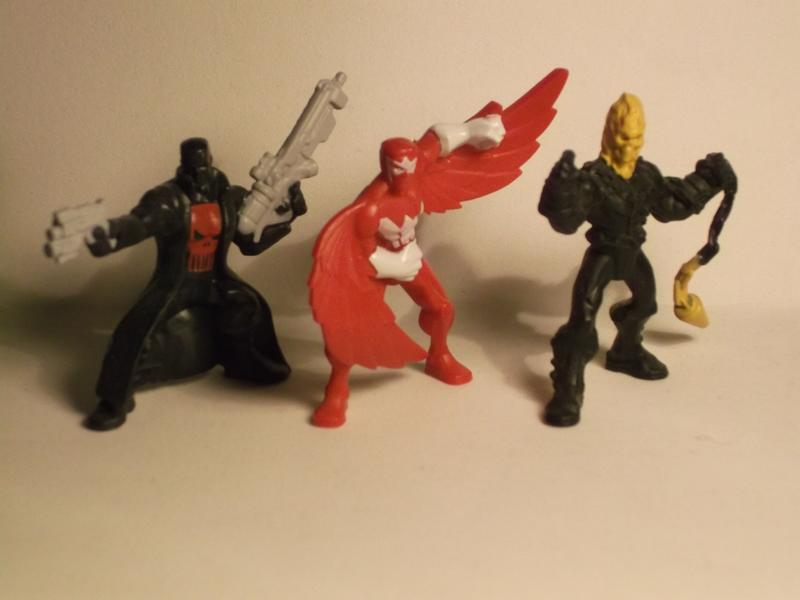 Amongst the Convicts who make up the bulk portion of Suikar's Legion, he is an inspiring figure. He gives them the thrill of constant combat, whilst also showing that even a Preator can work outside the bounds of the Ironglass Senates orders. It is under him many convicts turn to becoming Preatorian Guard, hoping to be chosen to be part of his personal cohort. From a modeling perspective, I used the normal Junker Plastic sprue for the main bulk of parts, and supplemented it with some pieces from Warhammer 40k Kroot and Space Marines. The sword was cut from the hands of an Island of Blood High Elf Lothern Sea Guard Champion. I think it is a good visual que to say this guy is more than just a rank and file Junker. The small knives at his side can work well as spare blades for real close up combat, as a sword that big isn't going to be useful all the time. Not that impressed with the pistol, but it will serve its purpose I'm sure. 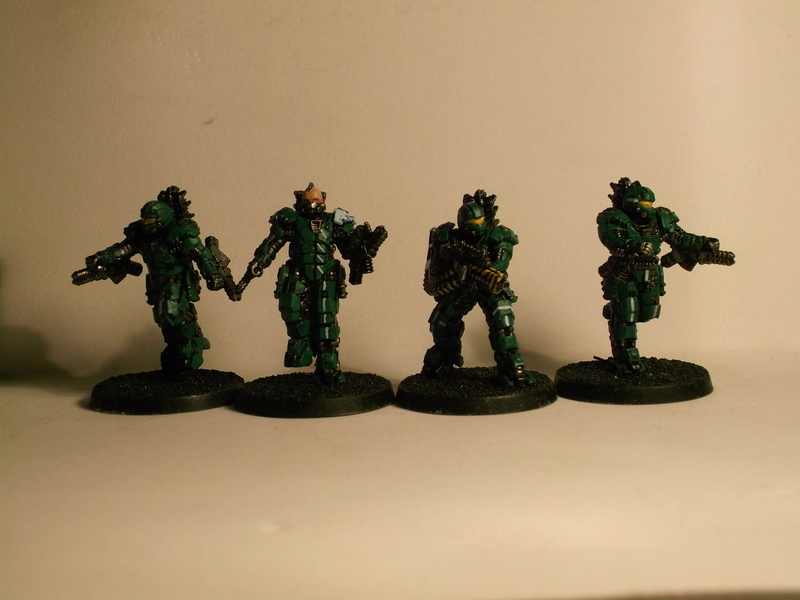 I also have some normal Junker models, which I'll be painting as Praetorian Guard to fight alongside the Praetor. Gonna be trying to do the odd single miniature every now and then, whilst also trying to finish the models I already have. 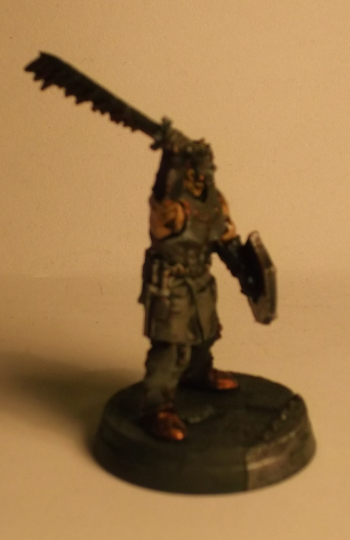 This update has been brought to you by my purchase of Anvil Industries 5th Anniversary miniature, The Blacksmith. 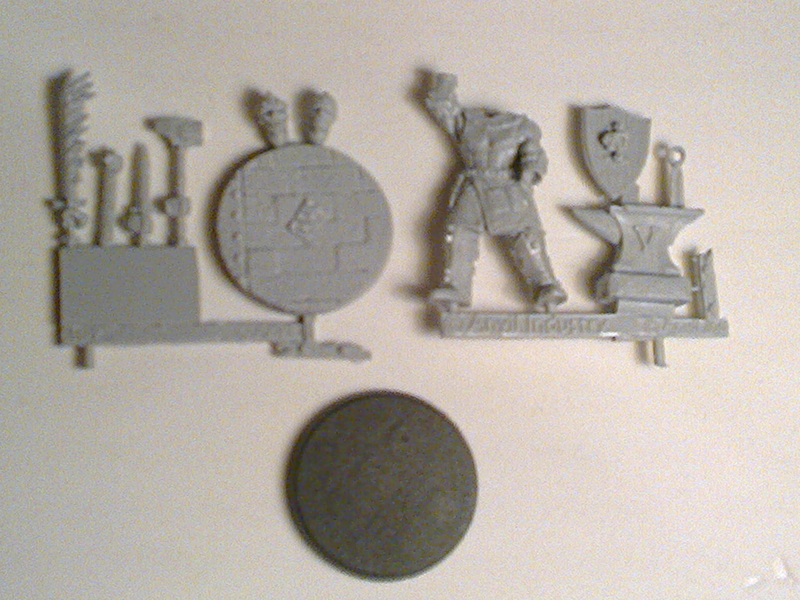 Though I need help deciding which model to make from the sprue. I was thinking of adjusting the shield arm so it was holding the shield wider, but looking at how much damage I could do to surrounding detail (I haven't done much modeling this past year) I don't feel like risking it. I ended up settling for a chaos warrior look, so flaming sword, mask and shield. 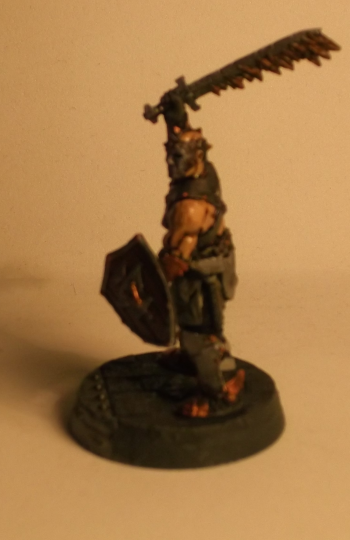 Overall feeling pretty good getting back into modelling and painting again. OOOooOO I like that chaos warrior looking dude. He looks very gladiator-ish. I would suggest one thing tho. I would paint the flames on the sword a bit brighter, because at first look i thought that the sword had a jagged edge rather than flame. Now this could be a photo thing making the flames look darker than they actually are. Working with limited colours for fire. I have some bright yellowish paints, so I'll be highlighting with those. Four months isn't too long between updates, right? Right? Today I unveil my squad of Pan-Continental Republic (PCR) Pulse Mechs. bought from Anvil Industries at the recent Games Expo held at the NEC. Pulse Mechs have 10" regular movement and 16" at a run. they're durable with toughness 12. The base Mag Carbine weapon (A paired weapon system) has 24" range, and two shots, and deals an decent 6damage per hurt. These can be replaced with a Frag Rifle, for an additional shot, and an increased range. The unit can be upgraded with a flight pack, granting "Flight", though sacrificing being hidden the turn its used. I'm thinking my collection for PCR is going to start off with a Mech force, which is surprisingly expensive for the number of bodies you get on the field. For that I need another eight Pulse Mechs, and then twelve Republic Exo-Mechs. Considering the number of hobby miniatures and kits I have in possession, you'd think I'd keep this thread going better. 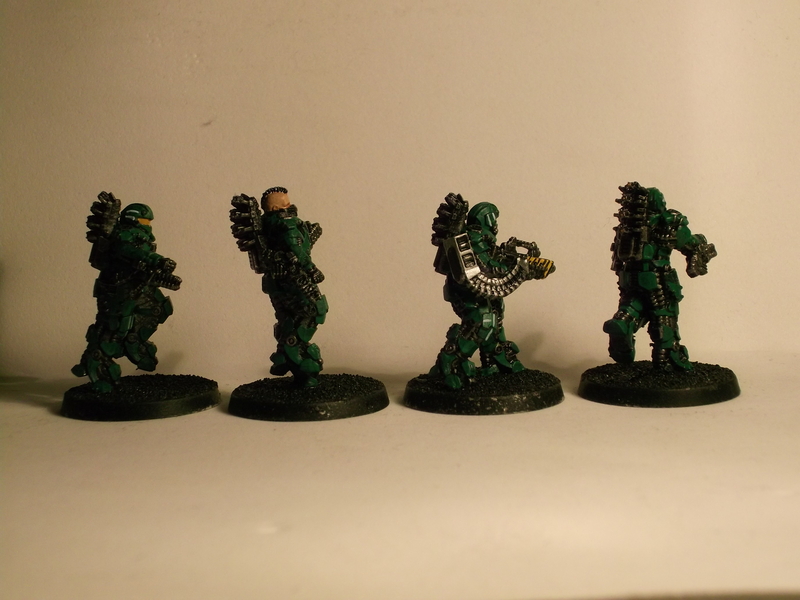 This up date is for my home brew Space Marines, The Tomb Lords. The chapter who ransack and utilise Necron technology. Over the decades since the chapters inception and ultimate excommunication from the Imperium. I was going for a Captain/Chapter Master who would be instantly identifable to players as significant. Also I really like poses which show more movement, especially in normally static space marines builds. Sadly a few of the paints I used in the past are now dried out, and I think beyond adding water to revive considering how many times I already watered them down to revive in the past. 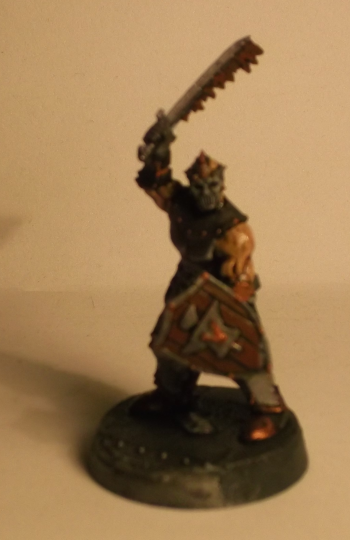 The paint scheme will be similar to the painted dude from this old photo from when I first started this chapter idea.